Vaibhav Vohra’s father is Delhi based businessman, Vipin Vohra and his mother is Pushpa Vohra. The Vohra’s are Punjabi. Vaibhav and his family live at Vasant Vihar in South Delhi. Vaibhav Vohra obtained his Bachelor in Science in Entrepreneurship from Babson College in Massachusetts, USA. Babson College is one of the world’s most respected colleges for the study of Entrepreneurship. Babson College’s Entrepreneurship course is consistently ranked Number 1 in USA. Famous alumni of Babson include Roger Enrico (Chairman Pepsico, Dreamworks), Akio Toyoda (CEO Toyota Motors), William D. Green (CEO Accenture), Edsel Ford II (Director Ford Motor), Arthur M. Blank (Co-Founder Home Depot). Vaibhav is a Director in the family business firm of “Continental Carriers Pvt Ltd”; which is in the Logistics and Freight Forwarding business. Continental Carriers is an important Forwarding agent for major international airlines such as Singapore Airlines, Lufthansa, Air France, Air Canada, Gulf Air, etc. Vaibhav Vohra’s company has offices in 10 cities in India. Vaibhav’s father, Vipin Vohra is the Chairman and MD of this firm. In addition to Continental Carriers Private Limited, the Vohra’s also own Continental Holding Pvt Ltd, Continental Logistics Pvt Ltd, Viva Freight Pvt Ltd, Vignair Pvt Ltd, Continental Hotels Pvt Ltd, Kay Kay Properties Pvt Ltd, DPD Continental Pvt Ltd, V and B Associates Pvt Ltd.
Ahana Deol-Vohra’s “Mehendi” (Henna) marriage ceremony was held at mother, Hema Malini’s, Juhu bungalow on 31 January, 2014. Both Ahana and sister, Esha Deol Takhtani, wore Lehenga-Choli by designer and family friend Neeta Lulla. 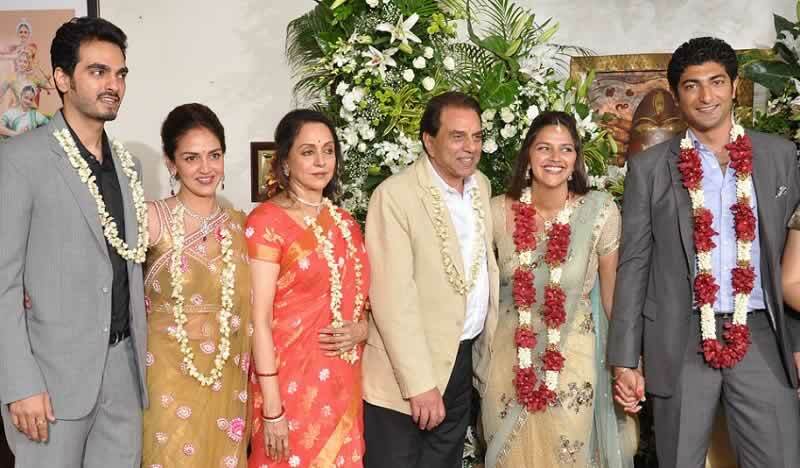 In addition to her mother and sister, Ahana Deol’s husband, Vaibhav Vora, her brother-in-law, Bharat Takhtani, her in-laws, her father, Dharmendra and aunt, actress Madhoo, were present at the “Mehandi” function. Ahana Deol and Vaibhav Vohra’s Wedding “Sangeet” ceremony was held in Mumbai on the 1 February, 2014. Hema Malini and Dharmendra’s youngest daughter, Ahana Deol married Vaibhav Vohra on 2nd February, 2014, in Mumbai. On the morning of 2 February, Ahana Deol and Vaibhav Vohra went to the Juhu ISKCON temple to seek blessings. Hema Malini’s elder daughter, Esha Deol’s Wedding to Bharat Takhtani had taken place at the beautiful Hare Rama – Hare Krishna ISKCON temple in Juhu. Both Tamil and Punjabi marriage customs were followed at Ahana Deol and Vaibhav Vora’s wedding. A Tamil priest and a Punjabi priest officiated over the marriage ceremony. Ahana and Vaibhav’s wedding took place on the evening of 2 February, 2014, at “ITC Maratha” hotel. The first half of Ahana Deol and Vaibhav Vora’s wedding followed Punjabi marriage traditions. Vaibhav’s traditional Punjabi “Baraat” (wedding procession) left Hyatt Regency, accompanied by “Band-Bajaa”. Vaibhav was seated on a horse. On reaching the marriage venue, “Milni” custom (meeting of key family members) took place followed by “Jaimala”, aka “Varmala”, or “Malai Mattal” in Tamil; which is the exchange of garlands. Once Ahana Deol and Vaibhav Vora were seated at the wedding mandap, both Tamil and Punjabi wedding prayers were chanted. Dharmendra performed “Kanyadaan”. This was followed by “Muhurtum”, where Vaibhav tied a Mangalsutra around Ahana’s neck. Next the main marriage ritual of “Saptapadi” (“Pheras”) was performed around the holy fire. Ahana Deol and Vaibhav Vora’s first Wedding Reception was held on 2nd February, 2014, at “ITC Maratha” hotel, near Mumbai’s Sahar International airport. For the various wedding ceremonies, Ahana Deol has worn bridal clothes designed by Neeta Lulla, Manish Malhotra, Shyamal and Bhumika. Guests at Ahana Deol and Vaibhav Vohra’s Wedding Reception included Shahrukh Khan (who came with a knee brace and a crutch), Amitabh Bachchan with Aishwarya Rai, Jaya Bachan, Abhishek Bachchan, Deepika Padukone, Rekha, Javed Akhtar with Shabana Azmi, Dia Mirza with soon to be husband Sahil Sangha, Ustad Amjad Ali Khan with son Ayaan Ali, Ranveer Singh, Ramesh Sippy, Anupam Kher, Kirron Kher, Sikander, Juhi Chawla with Jay Mehta, Anu Malik, Bappi Lahari, Sonakshi Sinha arrives with mother Poonam Sinha, Sanjay Khan, Zarine Khan, Farah Khan, Akbar Khan, Asha Bhosale, Baba Ramdev, Amar Singh, Uddhav Thackeray with Rashmi Thackeray, Ambanis, Subroto Roy, and many more from the world of entertainment, business and politics. Since Vaibhav Vohra and his family (father Vipin Vohra and mother Pushpa Vohra) are from New Delhi, Ahana Deol and husband, Vaibhav Vora will also hold a Wedding Reception in Delhi, on 5th February. The New Delhi Marriage Reception will be held at Vaibhav Vohra’s farmhouse on Bijwasan Road in South Delhi. Since both Dharmendra and Hema Malini have been Members of Parliament, this is an ideal opportunity to invite their politician friends to celebrate their daughter’s wedding. 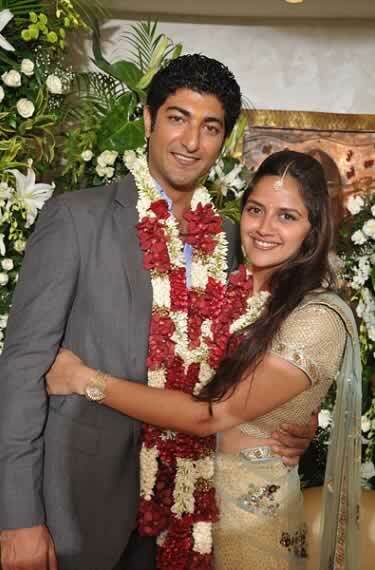 Ahana Deol and Vaibhav Vohra were engaged on 22nd June, 2013 in Mumbai. How Did Ahana Deol and Vaibhav Vohra Fall In Love? 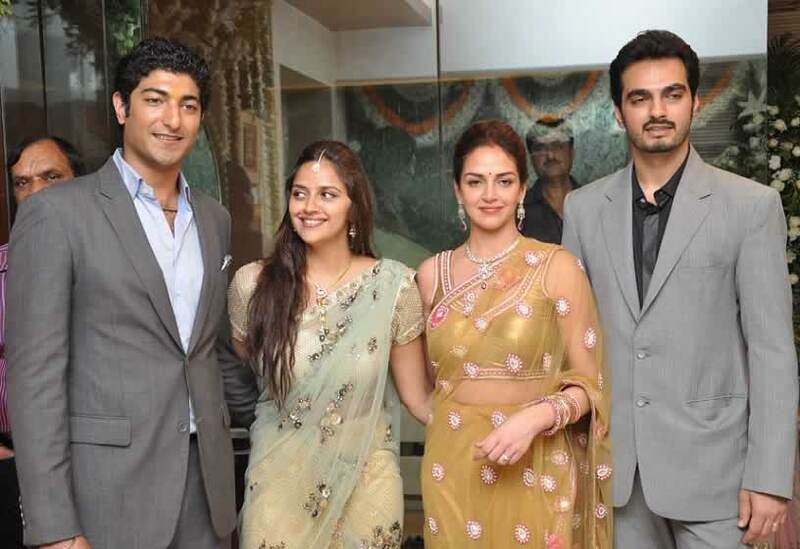 Ahana Deol, met her future husband, Vaibhav Vora, at sister, Esha Deol’s wedding to Bharat Takhtani. Vaibhav was a guest at Esha Deol’s wedding. Dharmendra knew Vaibhav’s family and had met Vaibhav earlier. It was Dharmendra who suggested to Ahana that she should meet Vaibhav Vohra. Aahana and Vaibhav became friends at the wedding, but it was only a few months before their engagement that they starting considering a future together. Vaibhav took Ahana for a holiday to Turkey. He proposed to her in Istanbul. 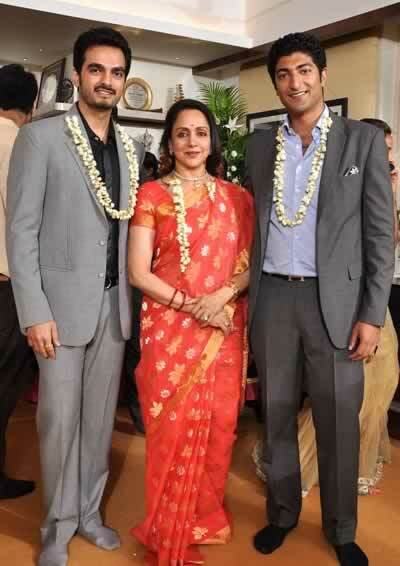 Ahana Deol and Vaibhav Vohra were engaged on 22nd June, 2013, at her mother, Hema Malini’s, Juhu bungalow. Ahana’s fiancé, Vaibhav, went down on his knees to put the ring on her finger. Vaibhav Vora and Ahana Deol’s wedding will take place in November, 2013 at Gurgaon. Born on 28 July, 1985, Ahana Deol is Hema Malini and Dharmendra’s youngest daughter. Ahaana Deol is a trained classical Odissi dancer, who performs regularly wither her mother and sister. Ahana’s elder sister is Esha Deol. She also has two elder step-sisters, Vijeta and Ajeita, who are Dharmendra’s daughter with his first wife, Prakash Kaur. Ahana Deol did her schooling from Mumbai’s Jamnabai Narsee School and her graduation from Mithibai College. Ahana has also done a film making course from Whistling Woods International Institute in Mumbai. Ahana Deol assisted director Sanjay Leela Bhansali during the making of “Guzaarish”. It is reported in the press that during the making of “Guzaarish”, Ahana formed a close friendship with actor, Aditya Roy Kapur.